Please inform Apartments Milena in advance of your expected arrival time. You can use the Special Requests box when booking, or contact the property directly with the contact details provided in your confirmation. Apartments Milena ~0.1 km, Bol price per day from € 38 Please inform Apartments Milena in advance of your expected arrival time. You can use the Special Requests box when booking, or contact the property directly with the contact details provided in your confirmation. Air-conditioned accommodation, great guest reviews, Bol ~0.1 km, Bol This large apartment is situated in the residential area of Bol and in its brightly colored rooms can provide you anything you need in the course of your stay in this lovely city. General details: air conditioner, barbecue. 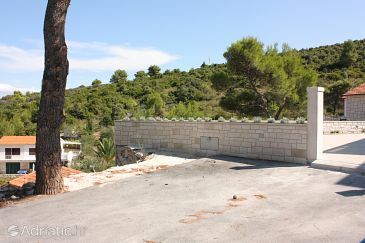 Distance to the restaurant: 70 m. Distance to the beach: 350 m.
Murvica ( ~ 5 km ): 3+ apartments,. Praznica ( ~ 7 km ): 2+ hotels. Nerezisca ( ~ 10.1 km ): 4+ accommodation units. Pucisca ( ~ 11 km ): 42+ apartments. Beach Samostan, Bol ~ 0,6 km from Apartments Milena Sandy beach: ideal for families, recommended for young people, awarded with blue flag, with restaurant, with caffe bar, equipped with showers. Beach Zlatni Rat, Bol ~ 2,4 km from Apartments Milena Sandy beach: ideal for families, recommended for young people, with restaurant, with caffe bar, equipped with showers. Excellent choice of watersports. Beach Fkk Paklina, Bol ~ 2,5 km from Apartments Milena Sandy beach: ideal for families. Nudism is allowed. Beach Basina ~ 7,3 km from Apartments Milena Concrete beach: ideal for families, with restaurant, with caffe bar, equipped with showers. Excellent choice of watersports. Beach Fkk Zecevo, Vrboska ~ 8,5 km from Apartments Milena Gravel beach: with restaurant. Nudism is allowed. Restaurant Restoran Centar Marijan, Bol Guest reviews: 8,5/10 ~ 2 km from Apartments Milena Address: Put Zlatnog Rata Bb, Bol. Cuisine: International cuisine. Restaurant Vagabundo & Bar, Bol Guest reviews: 7,2/10 ~ 0,8 km from Apartments Milena Address: Ante Radica 36, Bol. Cuisine: Croatian cuisine. Restaurant Arguola sandwich bar, Bol Guest reviews: 9/10 ~ 0,7 km from Apartments Milena Address: Ulica Vladimira Nazora 6, Bol. Cuisine: Fast Food. Restaurant Equinox, Bol, Bol Guest reviews: 7,7/10 ~ 0,7 km from Apartments Milena Address: Vladimira Nazora 6, Bol. Cuisine: Croatian cuisine. Restaurant Ribarska kucica, Bol ~ 0,4 km from Apartments Milena Address: Ante Starceviceva bb, Bol. Prices: 218 HRK - 868 HRK. Cuisine: Croatian cuisine.